My kids keep outgrowing EVERYTHING. I hear this is normal, but sheesh… would someone slow them down so my wallet can keep up with their clothing needs? With five children (16G, 9B, 9G, 7G, 4G) to dress, it becomes even more important that I choose clothing which will last and is cost effective. My Fall clothing budget is around $100-$150 per child (with the older ones taking a larger chunk of the overall spending because the younger girls get lots of hand-downs). When nine pair of undies can run $20.00 (or more! ), I have to be very careful with our funds. I also want to purchase items which will hold up well to kid wear and tear so that it can be saved for the next child (or passed on to a friend). If you are looking for a new backpack, check out Wenona’s post. Here’s how we do it. Garage sales- it’s high sale time in our area. I’ve found bargains such as Levi jeans (in harder to find slim sizes) for $1.00-$2.00 a pair. This is especially awesome for our son because he manages to put holes through the knees of all his pants, whether purchased new or used. I use Craigslist and our paper to determine where to garage sale and weed out sales which might have items I’m looking for. Thrift stores- When shopping at stores like Goodwill, I only purchase the half price color of the day. This requires more frequent visits to check for good items, but ensures we spend the least amount possible. We only visit stores that are close by. I was able to purchase 3 pair of nearly new jeans and 1 pair of new cords for $11. I’ve also found items such as a nearly new (insert three letter brand name here) dark denim jacket for $6.99. Don’t buy something just because the price is a bargain. If you aren’t going to use it, leave it for someone else. Many used clothing items are available online through eBay and Craigslist. Our friends have found like new hiking sandals (which retail for $65.00) for $15.00. Be specific in your searches to find any brands that appeal to you. Search out children’s resale boutiques in your area and watch for group consignment sales (ours are usually held at fairgrounds or church basements). Craigslist has been an excellent place to watch for these sales as well. Hold a clothing swap party, Amy Jussel wrote a great post on hosting a swap for the tweens/teens who are getting into brand envy. Hit up family members, friends, families from church or other organizations for hand downs. Often, if people know you are looking, they are more than happy to send things your way. Before you head out on your shopping adventures, go through closets and try everything on. Make four piles: it fits, grow into, repair/remake, and discard pile. Next, make a list of what each child needs (not what they want) and how you might be able to get those items. Save the discard pile if you have younger children, otherwise donate, trade or give them away. When you hit the stores (or net) complete your need list before even looking at anything else. If you do (and most of us do) need to purchase some new items, try to choose sustainable fabrics (organic cotton or bamboo) and buy from local shops or handmade artisans. 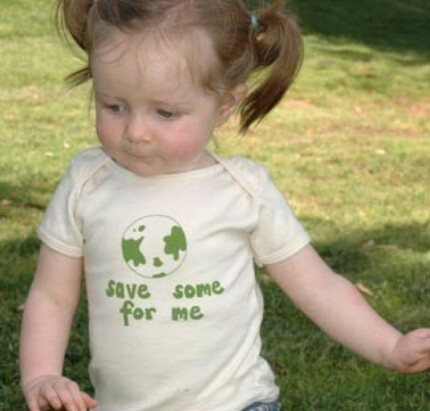 The adorable save some for me tee in the photograph can be found from CirclesAndSquares on Etsy for $20.00.